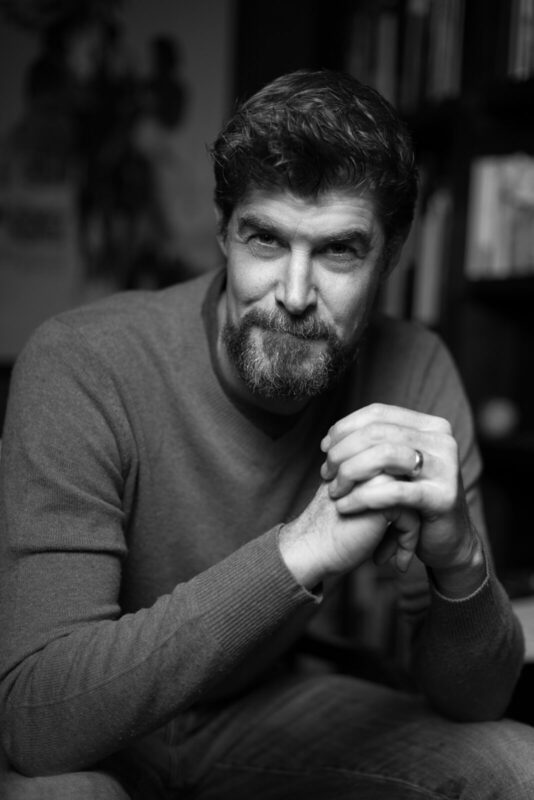 Doug TenNapel is a graphic novelist, game and TV developer. He’s a towering 6’8″ artist who has worked across a myriad of mediums, but perhaps his biggest success was the creation of the video game Earthworm Jim which also became a Universal Studios animated series and a line of action figures for Playmates Toys. His next TV series was Project GeeKer for CBS, animated at Sony Columbia Tristar. Eventually, Doug turned his talents to graphic novels and before long, his book Gear was developed at Nickelodeon to become the animated series Catscratch. Doug has written and drawn seventeen graphic novels and several of those creations have been purchased by Hollywood. Nowadays, Doug lives in Tennessee with his wife of 27 years and their four children, where he works in his home studio writing and drawing graphic novels. He enjoys fishing, reading philosophy, oil painting and designing his backyard to be an appropriate sanctuary for his collection of amphibians, of which he has raised over fifteen different species. This guy even makes his own beer, wakes up at four thirty every morning, records his inking sessions on Facebook Live and reads G.K Chesterton aloud with his friends. Now Doug has embarked on his first Indiegogo campaign for his latest creation Bigfoot Bill. We chatted with Doug recently about that project, as well as his thoughts on today’s entertainment industry, and what his feelings about being a “Comicsgator” really means. BF: Tell us the pitch for Bigfoot Bill and where did this idea come from? DT: Bigfoot Bill is kept in a deep state facility known as the Crypto-Zone. It’s where Loch Ness, Chupacabra, unicorns, The Jersey Devil, Mothman etc. are kept away from the public. But Bigfoot Bill dreams of exploring the outside world he has only heard about. He steals the Finger of Poseidon to gain control of the Kraken and the ancient beast becomes his super armor, providing him indestructible tentacles with near limitless strength. Bigfoot Bill escapes the facility and spills out on the streets of L.A. where he is joined by tons of other cryptids that escape… some good, some bad. BF: Who’s the intended audience for Bigfoot Bill? DT: Bigfoot Bill is written for everyone, though there may be some scary situations that some kiddos may not be into. I’d say 9 and up, but definitely a lot of meat there for adults too. BF: What stage is the project currently in? DT: I’ve designed all of the characters and written a four book super plot. I’ve done a script-ment of the first 64-page book and I’m in the middle of writing it. I’ve have to do more research on this book than any of my last 17 or so graphic novels! BF: Wow! Are you handling all of the creative chores on this? DT: Everything but the coloring. So I’m writing, drawing, doing the word balloons etc. 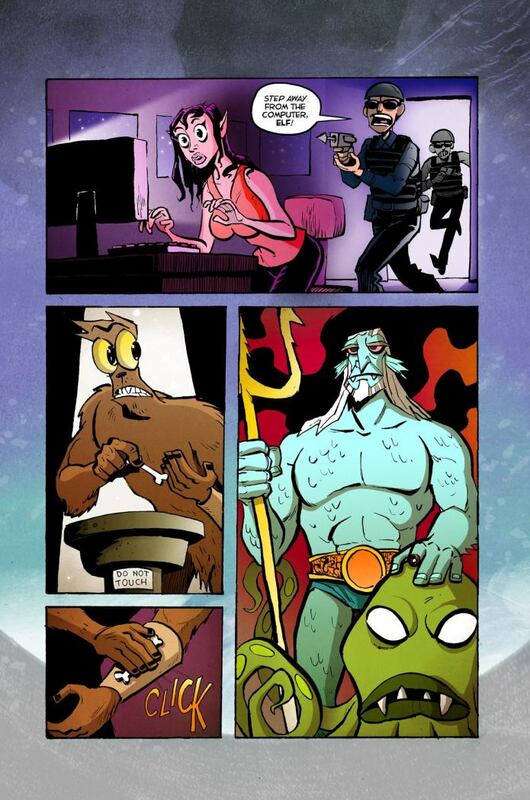 Colors are being done by a long time friend Dirk Erik Schulz… he did most of the color work on my pal Ethan Nicolle’s book series Axe Cop. BF: Any plans to later distribute it through Scholastic or a publisher like Image? DT: Not yet. I’m trying to make this a collector’s item with just my Indiegogo backers. These books will be rare by design and it will increase the value on the second hand market. After all four books are done in a year or two I might consider going broader with them, but if my backers pay to get it made, I’m satisfied with that. It’s a new model, but I did something similar when I offered my Kickstarter Sketchbook Archives books. BF: You’ve been in the comic industry for a while now. How did that come about? DT: I published my first comic under Mockingbird Studios, which was just a 17 year old kid who pretended to have a publishing company. It was in those early days when anyone could bang out a first issue and try to get big pre-order numbers. I did a comic: They Called Him Evil back in 1991 and it was the first appearance of Evil the Cat who later became a villain for Earthworm Jim. Eventually I did some work at Image Comics, and I’ve always had a great relationship with Image. They have treated me well and we’ve done ten graphic novels together! I think my first book was Earthboy Jacobus, I just showed it to Erik Larson and Eric Stephenson and they published it. It was kind of easy! BF: Your projects seem to mostly be whimsical and fun, do you ever have a desire to work on more serious minded projects? DT: I actually see most of my books as being pretty serious. I know that sounds weird, but I take these weird worlds pretty seriously. In most of my books there are real deaths, real stakes, and good and evil are clearly outlined. I just like doing odd-ball characters. I don’t do straight up realistic stories because I always went to comics for great adventure and fantasy myself. I recently wrote a straight up WWII story, and it just didn’t feel right. BF: Tell us a bit about your process, do you work on the visuals first or the words? DT: The main visuals that I’ll do is just a lead character model sheet and maybe a villain. Then it’s time for story and I stick to writing until the entire script is really tight. After that I’ll draw all over the script, designing additional characters and sketching locations before thumb-nailing. BF: You have your own Youtube channel that demonstrates your craft regularly, what made you decide to be so transparent about your work? How have fans responded? DT: I just thought of how much I would like to see a daily video of Ray Harryhausen or Mike Mignola in their studios. To my fans, I’m showing them a slice of my real life. It seems like that’s what is expected of many public creators and I’ve always been comfortable with being pretty transparent in public. It’s not that I like it, it’s that I am compelled to tell the truth. BF: Speaking of “truth,” you’ve caught some grief in the past over your religious and political beliefs. Has that gotten better or worse over the years? DT: That has gotten MUCH worse. It started as a little buzzing in the ear and has developed into a full blown up-ended beehive. Culture has never really understood what true tolerance means and now we don’t even bother doing anything on principle. People have just gotten unhinged. I’m basically the same person with the same views, so it’s not me escalating anything. But culture has grown completely nuts, and nowhere has it been unleashed quite like in academia, the arts and mass media… which happens to be my main areas of work. BF: Would you say this is one of the many reasons there seems to be a divide among comic creators and fans? DT: I do think there has been a change in the left being able to tolerate people who think differently from them yet creating art. It used to be “agree to disagree” and now it has become “You’re not just wrong, I must ruin you.” As a conservative that was never an option for me because all of my favorite forms of art I consumed were made by people who deeply disagreed with me. I learned to separate the art from the artist my whole life and I think I’m a bigger, more flexible, empathetic person for it. The idea that I would tell anyone, “Because of your beliefs don’t buy my book” is suicide. I’ve always had the most diverse of audiences and if anything, I like to use story to appeal to my audience to think about kindness, family, the Good. The worse the person the more I hope they read my work. I’d love that. Lefty artists don’t talk that way. Their politics diminish them. BF: You’ve worked creatively across more mediums than most artists. In your experience, is this same division of ideologies as prevalent in the other mediums? DT: It is. Liberalism has always been more appealing to artistic types and they have the cultural coverage to be more vocal about what they believe. That cultural coverage has extended so much more lately, to a point that they were able to act horrible before they would finally be called out. If I acted half as bad, I’d never be able to work again. BF: You’re an outspoken Christian, and your adherence to your faith has also raised the ire of many of the social justice minded fandom. Do you think the culture today makes it tempting to keep your head down and your mouth shut if you’re a person of faith, or a political conservative, or even a supporter of U.S. President Trump? DT: That’s always a temptation, and that’s largely what my conservative peers have chosen to do. But I like the idea of speaking out while I’m still free to do so in this country, even if only for just a bit longer. My confidence comes from knowing that I’ve thought these things out and nobody can change my mind by being nasty. I won’t give them that win. They didn’t earn it, so they don’t get my silence. It’s actually pretty easy to change my mind just by appealing to something true. I’ve had no serious offers on that front and it only gives me more confidence that I’m probably onto something worthwhile. BF: What is your feeling about the Comicsgate movement happening in comics these days? Several professional creators are decidedly against it and have labelled it a hate group. DT: Anyone who says Comicsgate is a hate group is either ignorant or lying. I’m not exactly the poster boy for Comicsgate because I don’t tend to join large groups, but given the kinds of names I’m called even by mainstream journalists and professional peers, I’ve earned my Comicsgate stripes. Comicsgate is full of professional comic artists and fans who largely love comics and resent the cultural backlash from leftists who demand they get in line every time a new, weird, progressive idea is rammed down our throats. I just want to make great comics. That used to be enough. Now it’s a gate-movement. That said, there ARE bad elements rolling around the edges of Comicsgate. Bad people want to co-opt any good movement. So I won’t stop from criticizing them any more than I don’t stop criticizing ANTIFA. But the left calling me “Nazi”, “bigot”, “homophobe”, “racist”, etc. is fAR more telling of them than of anything I’ve ever done or believed. BF: Do you see any way to unify people and mend these divisions, short of compromising your beliefs? DT: Oh, absolutely! I appeal to character traits that most people on both sides at least claim to hold like; respect, tolerance, humility, empathy, manners, etc. The escalation of this culture war cannot be solved by mutual assured destruction. The old principles that have been around since the beginning are the only way out. There is no other answer because no other answer is true. I do think there is reason to fight, but even in all forms of war we have rules about fighting. We all ought to consider those and that’s how I hope to conduct myself. I fail all of the time, by the way. BF: Ditto. Let’s get back to your work. It looks like Bigfoot Bill has reached it’s campaign goals, so it is definitely moving forward! Does the support you’ve received cause you to rethink the future for this character? 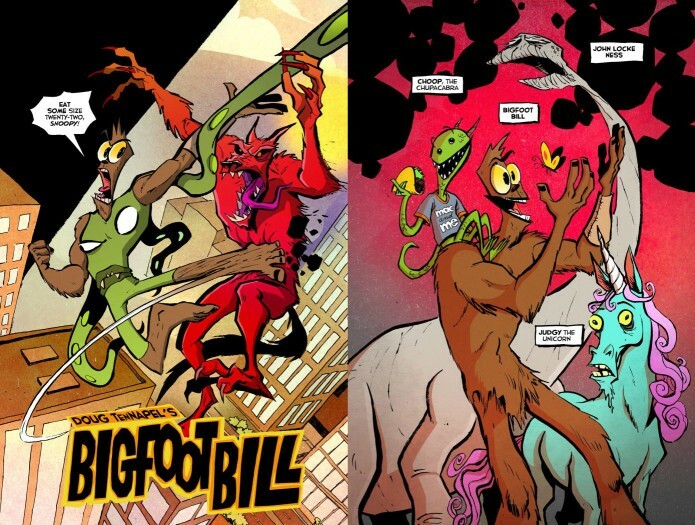 Could you see doing this crowdfund model for Bigfoot Bill again or doing any kind of ongoing graphic novels of the character if the finished work is well-received? DT: The Bigfoot Bill campaign has definitely opened my eyes to the value of directly developing an audience, interacting with them and listening to them. Audiences expect a lot more intimacy with their creators because we live such exposed lives, probably due to the cultural effect of Facebook. I started the Bigfoot Bill campaign as an experiment, I mean, I have two huge publishers already. I like that business, but this is just a completely different model and the businessman-artist in me is turned on by what is working about crowd funding. My three Kickstarters and now this Indiegogo campaign has produced some of my very best work, so the art side of me is awakened and brightened. BF: One of my all time favorite video games in the 90’s was Earthworm Jim. It’s now considered an unabashed classic and was later reworked as Earthworm Jim HD, available on PlayStation Network and Xbox Live until very recently. Are you aware of any other plans to make that available again? Are you even involved with the property in any way now? DT: I know that the rights holder, Interplay, is always trying to get something going, but really since Eartworm Jim 2 came out in 1995, they’ve little to show for it, mostly just re-hashes. That original team we put together in 1993 cannot be replaced so quickly, because that’s where the fun of Earthworm Jim came from. I’ve not really kept up to date on what’s happening with the character since. I really try to stay focused on what I can control over what I can’t. We just announced a playable demo as a stretch goal for Bigfoot Bill and that’s probably the closest thing I’ll ever come to making another Earthworm Jim game. 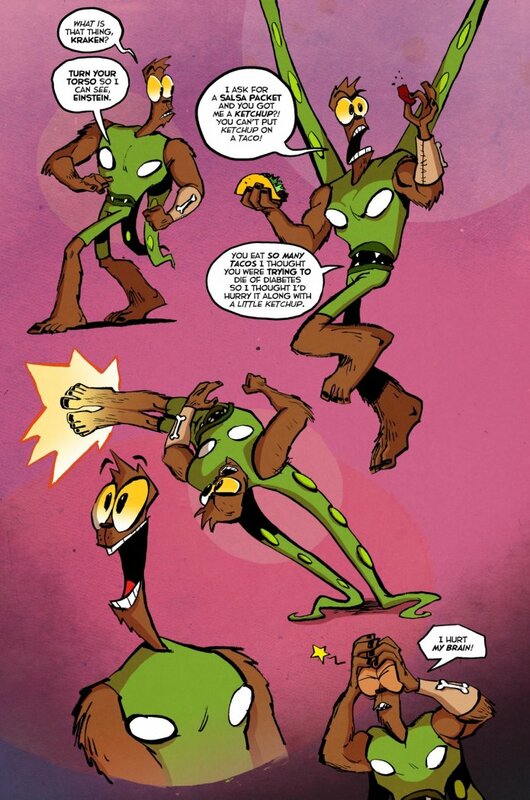 I have Earthworm Jim’s soul right here in my hands… and I put it in Bigfoot Bill. BF: Cool! Are there any plans to ever do another full video game in the future? DT: I’m always designing new games and characters, but the business model of making a full blown game is a multi million dollar effort! I don’t really want to be the president of a game company because I’ve already done that. And I ended up answering more phone calls than animating and designing games, so I’d have to have a robust business partner before I tried that again. I basically need a billionaire oil tycoon to be my patron and I would destroy the world with video games. That or I might Indiegogo something. But yikes! Comics are so much funner and easier to make! 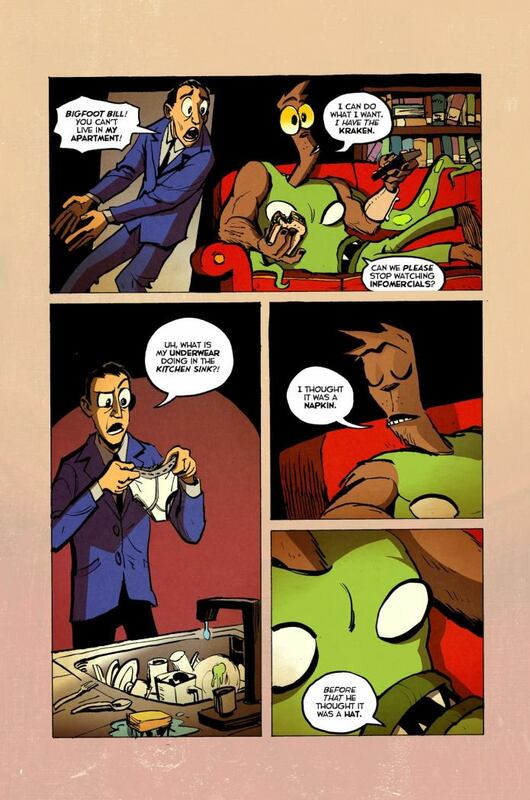 BF: What other upcoming projects can we look for from Doug TenNapel? DT: I’m working on a script for a feature. That’s all I can say about that. 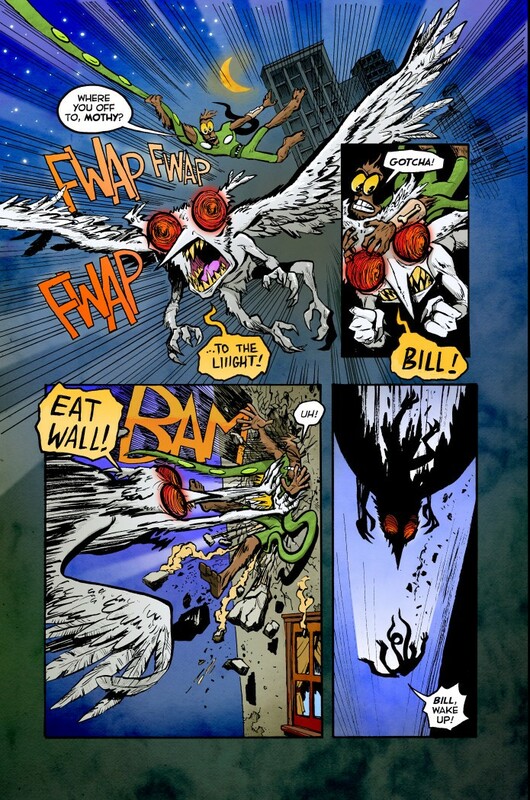 But I’m most excited about re-releasing my out of print comics through Image… Creature Tech comes out in December in new full color edition. Other than that I’m all about pouring myself into Bigfoot Bill. It’s been a blast so far and I’m really looking forward to sitting at the art table for the near future. BF: We are rooting for you, Doug. Thanks for your time! DT: Thanks for the coverage! I love me some Bleeding Fool. Click the image to get in on this successful graphic novel campaign before time runs out September 22, 2018! Check out the low barrier to entry for this project.